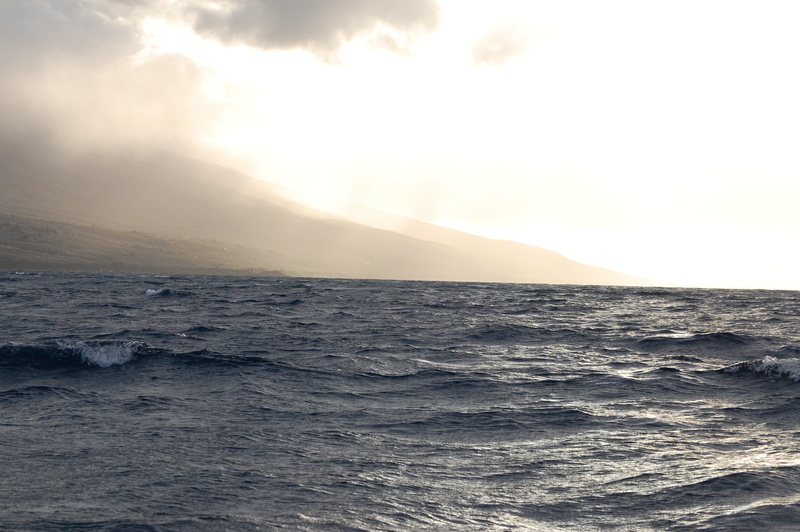 While whale watching in Hawaii I sprawled on the floor of the boat, having decided in a split second that it was better to fall backward than to go overboard into the ocean. The small boat was battered by thirteen-foot waves, rocking from side to side like some perverse cradle. But I was giggling on the floor. Whale watching was a blast and I wouldn’t have given it up for anything – especially with what was yet to come. I set out early in the morning with Eric, another writer on our Molokai Visitors Association trip to Hawaii. We both wanted to take a shot at tracking down some humpback whales. They were in the process of migrating north to Alaska. In a few more weeks, they’d all be gone. I popped up off my padded chair in the center of the boat and looked over the starboard side. And sure enough, my eyes following deposited slicks floating on top of the waves, we spotted a dark spot in the water. A quick moment later he cracked the surface and shot a spray of water into the air from his blowhole before diving back under. I had seen a whale! It wasn’t my first time – I had actually gone whale watching three times previously – but I could not have been more excited. It would even be safe to say, embarrassingly enough, that I was rather giddy at the experience. Up and down the big guy went, catching his breath as he continued his journey north. His spouting continued, and then he gave us a surprise. Coming up strong, although not strong enough to create a giant splash in a breach, he dove deep, bringing his fluke up above the water as if he were waving goodbye. I gasped and then started clicking away with my camera. 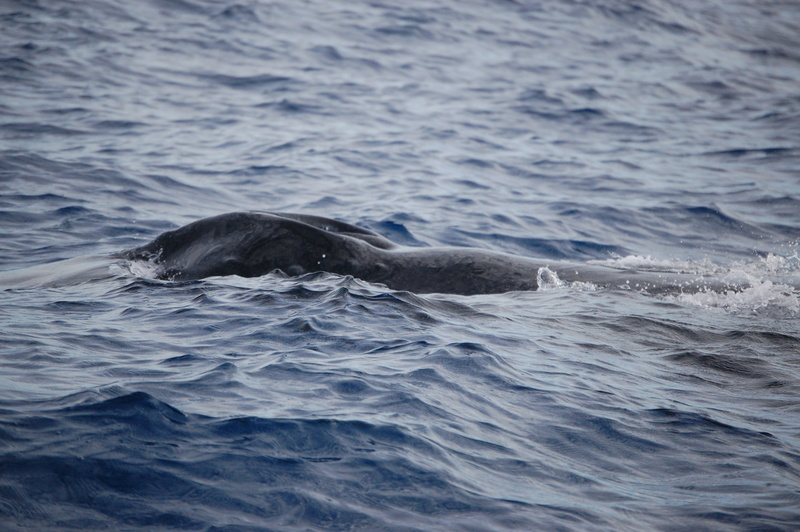 I had seen humpbacks before and knew this might be my only chance to get a picture of his fluke. Once they dive they can stay under for a while. So I had to be quick on the trigger and simply enjoy the moment through the lens of my camera. And as if he waited long enough for me to get what I wanted, the moment froze and I snapped one of my favorite souvenirs from the trip. Smiling and bouncing, I showed the picture off to the others on the boat. Hours before I felt like I was climbing onto the S.S. Minnow for a three hour tour, but now I was grinning as though I were on the best vessel in all of the Pacific; it was an exceedingly happy moment unlike I had ever had before in my whale watching adventures, which were all less than admirable due to poor photographic equipment. But now I had a beautiful shot that I knew I would frame and treasure upon my return. Pulling the camera away from my face, I felt like I should be content with my photo and take a few minutes to just appreciate the moment. After all, it’s difficult to truly connect with an experience like this if it is only seen from behind the camera lens. 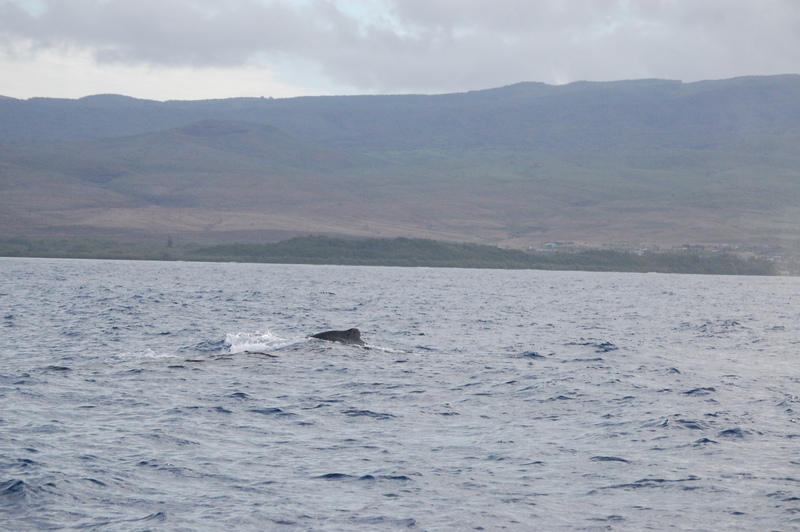 And I wanted to leave Molokai with more whale memories than the few I would have on my memory card. A whale came up to breathe and then went back under. I struggled not to react with my camera. It is too natural of an action, pulling a camera up to capture that special moment when it occurs. But I remained calm – a grin still plastered across my face – and watched some of nature’s most amazing creatures. In another split second reaction, as a humpback came up for a breath, I disobeyed myself and lifted the camera and clicked away. 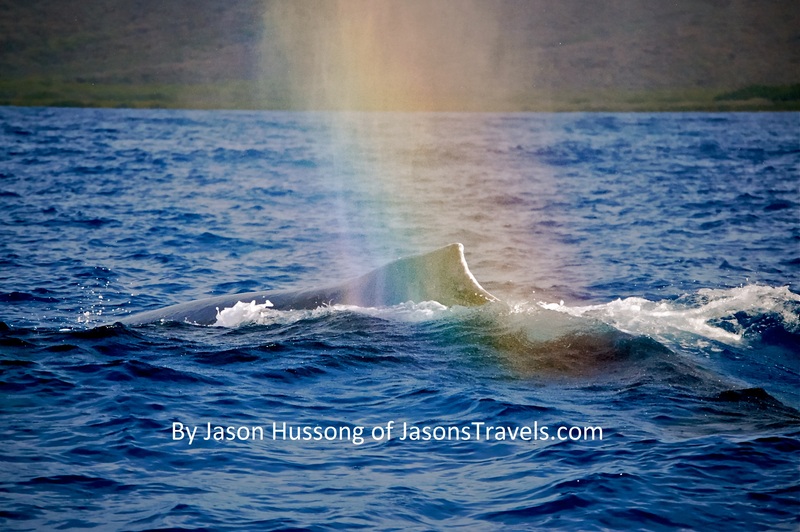 Again it was as if time momentarily stopped and offered me what I never thought to be bold enough to wish; the water cascaded down onto the humpback’s dorsal fin painting a rainbow on his back. Magical shots! As a writer and photographer, I am often conflicted as whether to watch the scene with the naked eye for the sake of the story or through a camera lens, for the sake of the story. Wow, nice humpback whale pics man! 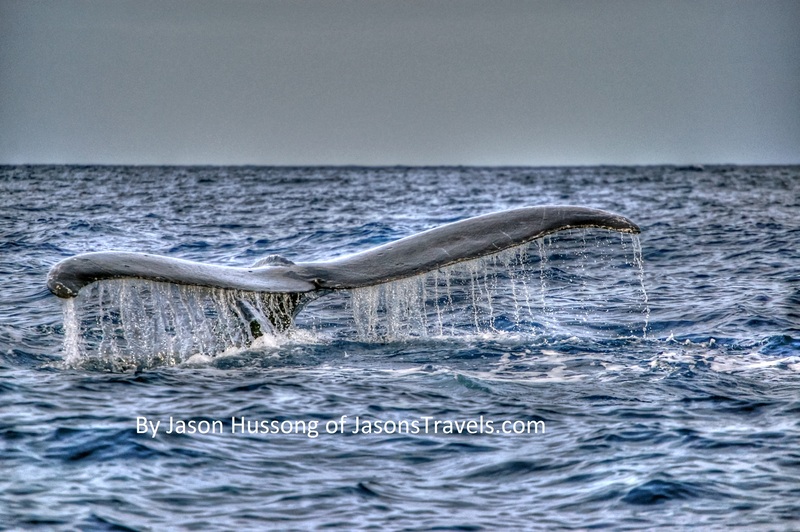 Are you coming back this upcoming whale season? Thanks! I’m definitely heading back to Hawaii this next year, I’m just not sure when. Ideally it would be during whale season, though…March, maybe. 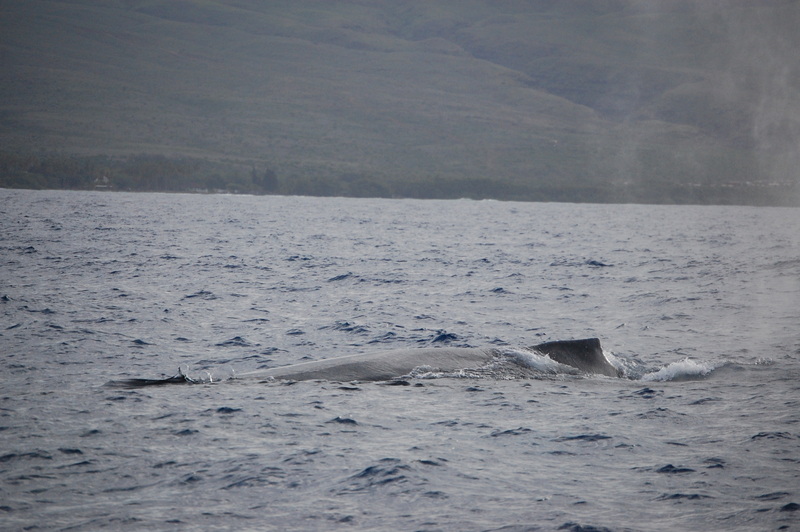 If you come to Maui I can get you comp’d on a whale watch tour if you like (just send me an email). Good luck with your future whale photo endeavors. Thanks so much. Please send me your contact info through my “About” section and I’ll definitely be in touch.